Chiang Mai (Thailand) – March 12, 2018 (travelindex.com) – The Thailand International Balloon Festival in Chiang Mai celebrated it’s 10th anniversary of Thailand’s first and only International Balloon Festival, from 2 to 4 March at the Cowboy Army Riding Club, Chiang Mai. 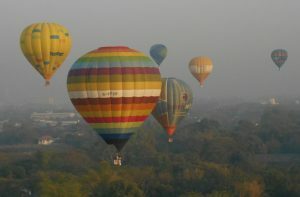 Thailand International Balloon Festival is considered top of the most popular balloon events in Thailand and South-East Asia, with participants from as far as the United Kingdom and Germany. The exciting sensation of hot air balloons rising serenely into the morning skies, creating a sense of adventure and a sense of freedom that draws visitors to the Thailand International Balloon Festival for the last 10 years. Visitors enjoyed spectacular sights of colourful hot air balloons gracefully drift through the air, and the festival’s signature, sensational balloons night glow decorated Chiang Mai’s sky at night. This year was the first time ever in the world that “The Sparkling Glow” of the balloon nightglow created by Sornchat Krainara, the Festival’s Owner and her Boon Companion Composer, Bringkop Vora-Urai. The night glow was synchronised with specially composed music with the Lanna Orchestra combine The Tiger Drum and Opera which has never performed anywhere before. The spectacular Thailand International Balloon Festival is more than hot air balloons but a fun-loving festival held over three days, combining plenty of special attractions, activities for the whole family and delicious food from top hotels and restaurants in Chiang Mai. One of the special guests was Thai celebrity chef Som Chanakarn, displaying his talents. Guests could also enjoy the coffee carnival showcasing some of the best coffee that Thailand has on offer and many other events as art exhibitions and workshops as well as Thai fashion and jewellery shows from famous Thai designers. Mark your calendars early and make sure you don’t miss next year’s International Balloon Festival in Chiang Mai.